A few weeks ago on a road trip to Reno to see an Elvis Costello show, we stopped along the Byway to see Great Basin National Park. The park is located near Baker, Nevada, near the Utah border, just off of the Route 50 "Loneliest Road in America" stretch that crosses from Fallon to Delta. You must do this drive if you have the chance. It is amazing in its remoteness and beauty. 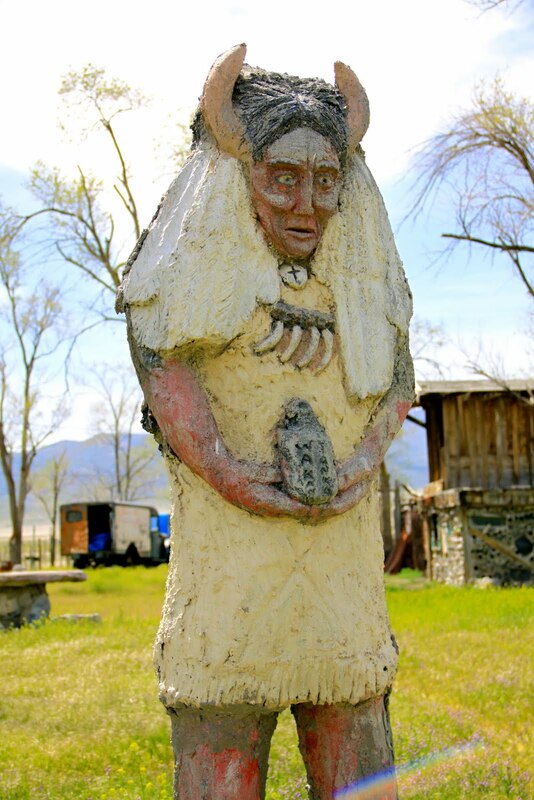 The Great Basin National Park has a lot of interesting things to experience. In the high desert, this park hosts 13,063 foot Wheeler Peak. It has 5,000 year old Bristlecone pine trees - some of the oldest trees in the world. That alone is a reason to go there. The area has some of the darkest night skies in the United States - high elevation, low humidity and very low light pollution means this is one of the best places for star gazing in America. It also has the Lehman Cave, which was the purpose of our visit on our fast drive by the park at the end of a long weekend visit to Nevada. We did not have time to stay longer, camp and really explore the park - that is for future visits. This national park is named for the Great Basin which is the largest area of contiguous watersheds in North America. It is a 200,000 square mile hydrographic area that drains internally. All precipitation in this area evaporates, drains into the ground or into lakes. No water from this area reaches the ocean. It also contains the lowest elevation point in North America, Badwater Basin, and less than 100 miles away, the highest elevation point in the contiguous United States, Mount Whitney. The Great Basin encompasses Reno to the west and Salt Lake City to the east and extends south to close to Las Vegas and north into Oregon. It includes Lake Tahoe, America's largest Alpine Lake. Much of the geography of this region is desert and sparsely populated. Lehman Cave was my first visit to a cave. 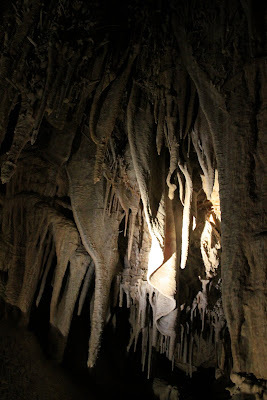 All those years living in Pennsylvania, Virginia, Maryland and Washington, DC I never once visited Luray Caverns out in the Shenandoah area of Virginia. All my Byway travels I just never visited a cave. I think caves are fascinating, but they also freak me out a little. Being under ground, in tight spaces, in the dark - just not my thing. I am amazed at the feats of spelunkers and I am sure they see some incredible sites, but I don't think I will ever find myself doing that. But Lehman Cave, like Luray, is the kind of cave that has been set up for visitors to walk in on a guided tour. No crawling. Established walkways. Lights (except when they turn them off so you can see and feel the true darkness of the cave). Very safe. Very much not freaky. Especially if you have someone to cling to when they turn off the lights. Apparently May is a good time for water in the cave. Usually there is no water. Lehman Cave was discovered in the late 1880s by Absalom Lehman (proudly from my home state of Pennsylvania). Lehman had a mining history from Australia but had settled in that area, Snake Valley, for cattle ranching. Soon after his discovery, Lehman was guiding 100s of visitors a year into the cave. After his death the land was sold and by 1912 it became protected as part of the Humboldt National Forest. Lehman Cave became a national monument in 1922 and was loosely managed by the US Forest Service. A couple who owned land in the area acted as custodians and oversaw continued work in the cave to clear pathways and guide visitors. For awhile they used one of the larger rooms as a site for meetings and parties, including weddings, dance parties and Boy Scout jamborees. In that room where they once held all of these events there is graffiti on the ceilings - over 100 years of people leaving their names. Being in that room it was fun to imagine all the people who had been there and the crazy things that must have happened down in that cave. Candle lit dance parties pretty deep into a cave? I would have loved to have been there. Over the years the National Park Service took greater control and continued to improve the site for visitors. Electricity came into the caves in the 1940s replacing the older candle lit tours. The cave was amazing. I am so glad we took the tour. I can now say that I am not afraid of these kinds of caves and I look forward to seeing more in the future. This visit inspired me to go and see the new documentary Cave of Forgotten Dreams about the Chauvet caves in France. If you have an interest in caves and ancient man, I recommend seeing the film. I don't have other cave experiences to compare it to, but I am assuming that Lehman is much smaller and more mellow than a place like Luray. From all the signs I used to see on the Virginia roads advertising Luray, it just seems like a very touristy place. The Lehman Cave is not that known and is far more isolated as it sits in a national park that is off the beaten path. So, I feel this was probably a good first cave experience. I don't like to visit places that are super touristy with crowds of people. If you feel the same way, then this is a cave for you. 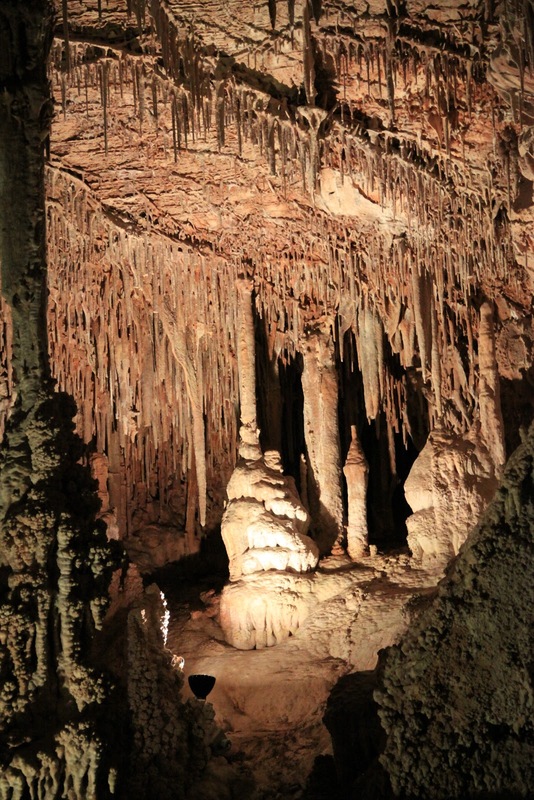 Here are some tips for visiting the Lehman Cave. You can only enter the cave with guided tours. Park rangers give the tours every day of the year except Thanksgiving, Christmas and New Years Day. We had an excellent tour guide. You should make recommendations ahead of time, especially in the summer months. We visited the cave in early May, on a Monday, and took the very first tour of the morning. We were lucky in that our tour group consisted of only my husband and me and one other couple. Tours are typically up to 20 people. If you can score a tour with so few people, it makes the experience all the more amazing so I recommend going to see the cave when it is not high tourism season. It is a very different experience when you have a small, quiet group. They do a lot of school tours so you may want to check to make sure you aren't going to be touring at the same time. Tours are given from 9-3 in the winter and 8:30-4 in the summer. You can do a 60 minute or 90 minute tour. We did the 90 minute tour and I recommend it. You see more rooms in the cave. Costs are $6 or $8 for adults. Kids are less expensive and they have senior discounts. 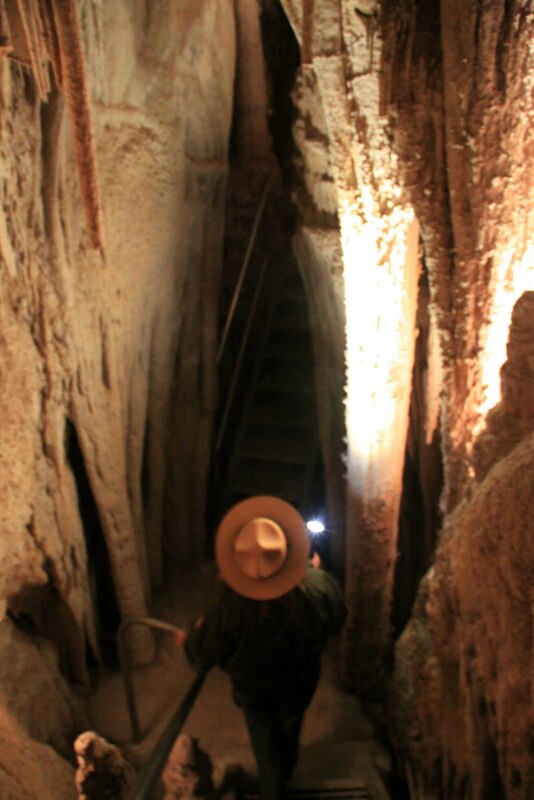 In the summer months they do candlelight tours so you can see what it was like for the first people who explored these caves back in the 1800s. The caves are chilly (50 degrees) so dress appropriately. You can not bring anything into the caves other than a hand held camera and flashlight. You can't bring water, food, gum, bags and backpacks. You don't have to bring a flashlight - they have lighting. You can take as many photos as you like and you can use a flash, but from my experience the flash changes all the colors and lighting and the photos look weird. I set my camera for the highest ISO (3200) for me and that allowed me to take the photos you see here without a flash - not the greatest, but good enough to capture the sites. They are now screening for White Nose Syndrome. Meaning they want to know if you or any of the clothes you are wearing have been in a cave. They do not want you to bring White Nose Syndrome bacteria into the cave that currently does not have it. There are very few bats in this cave. The guide said they rarely or never see them. We were fortunate to see one very tiny bat. I love bats and wish there were more. There isn't much living in the cave and entrances are restricted, so this is probably why you don't have a lot of bat activity in this cave. The elevation of the park and the cave entrance (6,825 feet) is very high, so you should plan for a lot of snow on the drive up in the winter months. Cave Bacon. Yeah, it really does look like bacon and that really is its name. Cave graffiti - two women who made it way back into the cave in the late 1800s. Awesome. We hope to build our home on a site where we can see this view - San Jacinto Mountain- from our roof deck. Equipped for some digging and pole placing. Silly hats are unfortunately a necessity to keep out of the crazy sun. Not a true ground breaking. Just placing some poles for possible sites for the house. Don't let this photo fool you - my husband did all the digging. The desert still had some flowering going on including these stunning cacti flowers. We found a snake. Is this a California King or Pacific Gopher snake? I am unsure - either way, thankfully both are harmless to humans. Took this on our road trip. 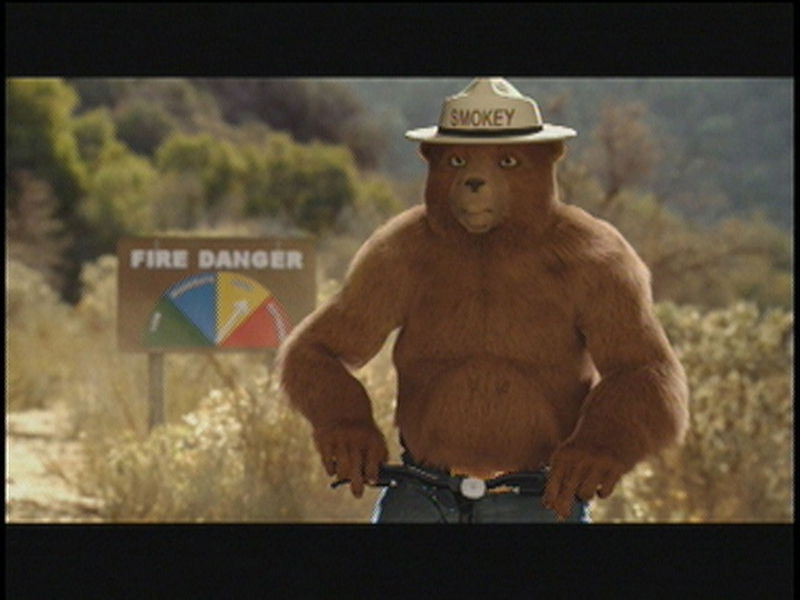 "Only you can prevent forest fires." I grew up seeing and hearing Smokey Bear, or Smokey the Bear, on television and on road signs everywhere. The other night Smokey Bear was in my dreams. I am serious. I remembered it when I woke up and I told my husband about it. I don't remember a lot of details. There wasn't a lot going on in the dream. I was just dreaming about Smokey Bear and in my dream I was disturbed because I was noticing, for the first time in my life, how much of a weird bear-man creature he is. 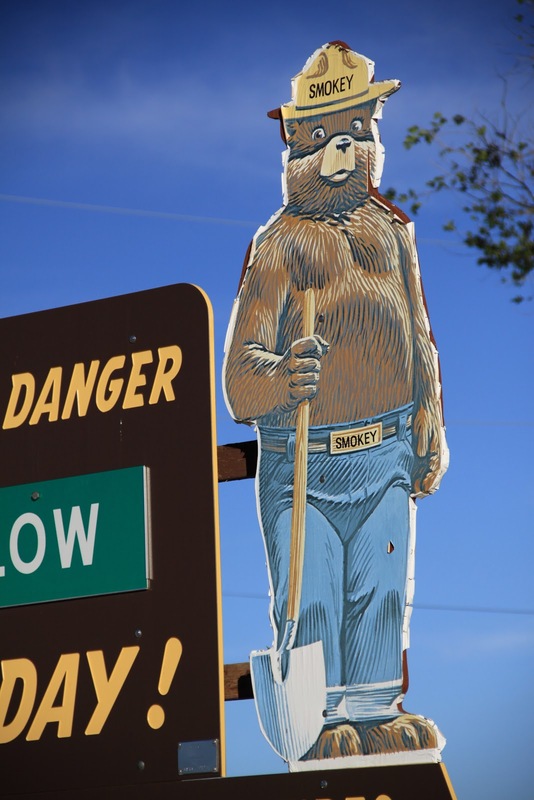 I cannot believe I never really noticed it before - that Smokey Bear is really just a man with a furry body and a bear head. I think what I find disturbing is his naked torso. He wears pants, but he never wears a shirt. I understand why you would want to put pants on your cartoon creation. But then why would you not have him also wear a shirt? More disturbing is how in many images he has these ripped 4-pack abs and defined arm and back muscles. Like a man. A bear man. Does he have to have that? To make him look more tough and manly? Look at the images below that I found on the internet. It is weird. Just weird. 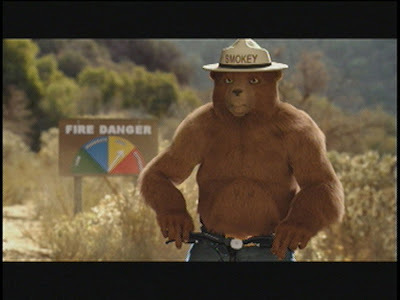 My childhood innocence and love of Smokey is now tarnished. Thanks a lot stupid dream. Llamas, llamas, llamas!! And Alpacas. Ever since I discovered this place in September last year, the Scipio Flying J gas station has become a mandatory stop for us when driving on Route 15 between Salt Lake City and the Nevada border. 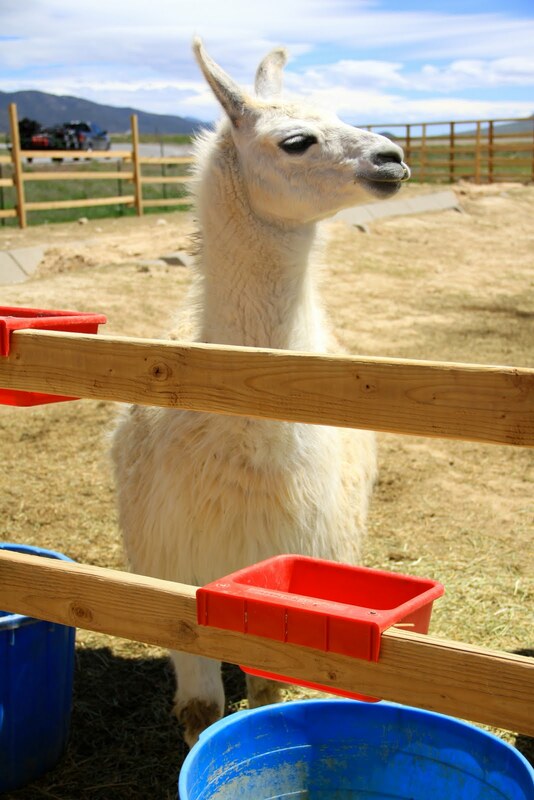 Why wouldn't you stop at a place that offers gas, a mini-market, clean bathrooms, Dairy Queen AND this petting zoo?! Most times when we drive through it is early morning and the petting zoo isn't open yet, but you can still see the animals. You used to be able to pet them even when it was officially closed, but every time we go there it changes. They seem to be expanding the animals they have and also building up the facilities. It probably opens by 8 or 9 am and stays open until the afternoon. When it is open you can walk in where the animals are and pet them or feed them. It is free, but they accept donations. You can sometimes see them feeding the animals and you can buy feed for a quarter to feed them. 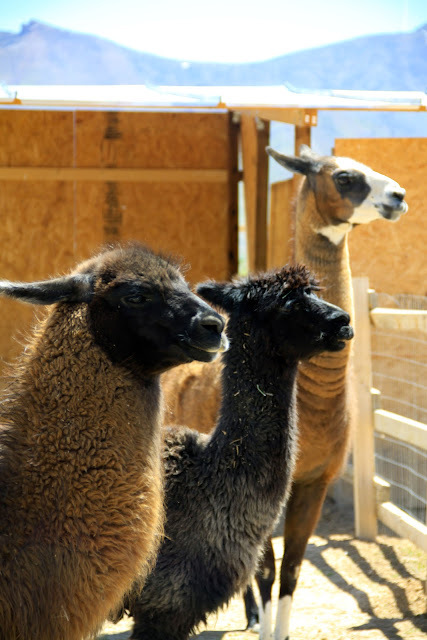 They now have a baby zebra and baby lambs in addition to the llamas, alpaca, sheep, cow, small horses, pygmy goats, emus, rabbits, chickens, peacocks and ducks. - Baby zebra joins the petting zoo - March 2011. - End of December 2010 visit. - September 2010 - my first visit. From the Hoover Dam last Thursday...more information and photos coming soon. Happy weekend! Last night we attended the Skate Surf Auction in Santa Monica as part of the annual Venice Art Walk. Friends organized this art auction event. Reused, recycled and recreated skate decks and skate boards by more than 60 artists, including ones done by the Dogtown and Z-boys guys! There was even one from Stacy Peralta (! ), surfer, skater and film director. Should I have bid on that one? None of the skate decks were that expensive, which was great and why we bid on and won two - see photo. Artists are EyeOne on the left and Kristy Campbell, friend and one of the event organizers, on the right. We love both of these boards so much and are so happy we were able to bid and win. All proceeds from the auction and event go to the Venice Family Clinic. Overall it was a really, really fun event and our friends did a fantastic job organizing it. The skate/surf art was interesting. The very cool art space at Bergamot Station Arts Center, once a stop for the red line trolley running from downtown Los Angeles to the Santa Monica pier, was perfect. They had a good, groovy band - Mayfly Dance - perfect for the show. And the crowd was large and eclectic and fun. Very arty, very hippy, very groovy. Very California - in the humble opinion of an East Coast girl. I loved it. The Venice Art Walk continues through the weekend, so, if you are in the area, and the world doesn't end today...you should check it out. Lots of great, affordable art. Yesterday, driving the Byway from Salt Lake City to Laughlin, Nevada (Arizona border) I took more than 500 photos. The day I grow tired of looking at these gorgeous Western skies will be the day I am dead. Driving in Nevada two weekends ago, the Byway led us here to this place that if it hadn't been such a happy, sunny day could have become the stuff of nightmares. 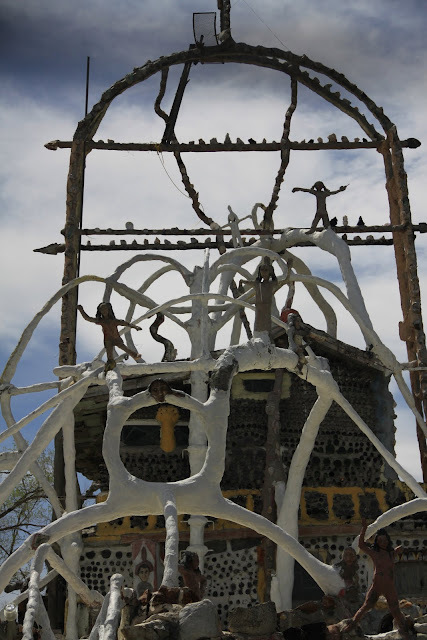 We were alone, tramping around this isolated place, wondering about the artistic insanity behind its development. Yeah, its folk art, but very creepy, very cool folk art. To learn more about this place - where and what it is - stay tuned. 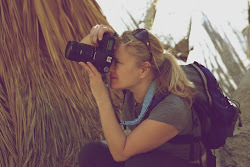 I will be revealing all soon in an upcoming blog entry. This is definitely a must-see stop on the Byway if you are driving across northern Nevada. Go, go, go to Lake Tahoe! Such a beautiful place. I can't wait for the opportunity to return. Some say the end of the world is coming. That it will start on Saturday. 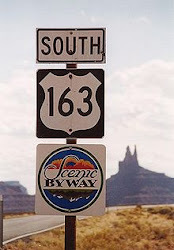 We will be traveling the Byway again. So much to see in the world, isn't there? If the world ends, we will go down doing what we love and with the one we love. Hand in hand. On Thursday we head to the Hoover Dam. Something amazing to see before the end - when ever that might be. Friday to Venice Beach/Santa Monica to see friends and attend an art show/auction. Friends. Art. Wonderful. Saturday we will drive to San Diego to visit family. If the world does start its end - they say earthquakes will roll across the planet from the Pacific - you will find us there - with loved ones and two big wonderful dogs. 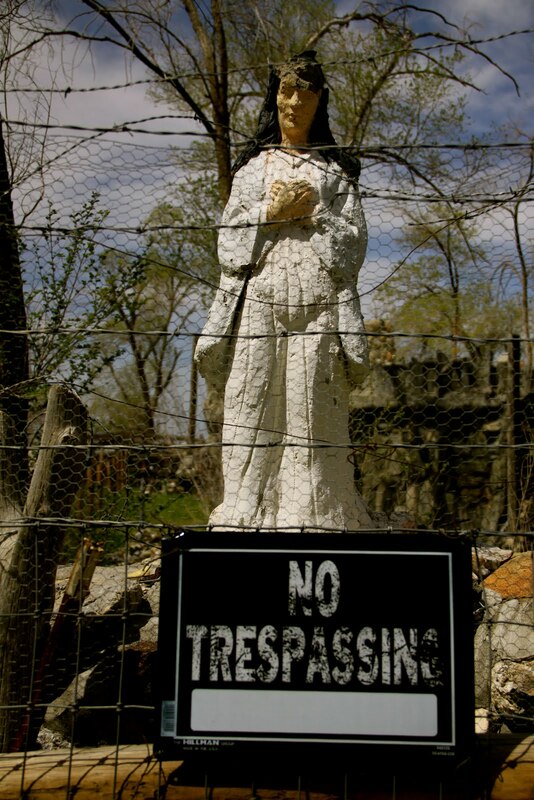 I like to photographs signs I see on the Byway. Little fragments of the places I've been or passed by. Memories. Think of how many people have gazed at these signs. What did these signs mean for them? Love this. We found this sign as we crossed from Nevada back into Utah...of course we had to turn around to see it. I want to know who put that truck up there! Classic kind of motel signs you see all over the west. I like the "best-kept secret" and reference to food coupons. 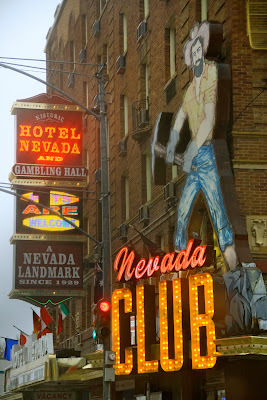 Old former mining town on Route 50 - sad little gambling places everywhere. Yes, the land of SHOW GIRLS! Old store window in one of the 3 towns on Route 50 across Nevada - Loneliest Road in America. More gambling in another old mining town on Route 50. These towns knew better days.